The Books Arts Studio holds regular open studio hours each semester, during which students currently enrolled in Book Arts Program classes as well as approved studio users have access to the space and its equipment. Please note that studio users are only able to use equipment they have been trained on. During open studio hours, volunteer monitors are present to assist studio users. 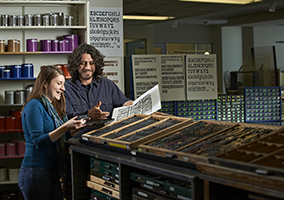 Upon successful completion of a Bookbinding, Letterpress, or Artists' Books class, a student can submit a Proposal for Book Arts Studio Use. The BAP staff reviews all proposals and sends notification to applicants as soon as possible, along with details about studio dates and hours for the relevant semester. At the discretion of the BAP staff, applicants with adequate experience who have demonstrated the ability to work self-sufficiently will be approved for Independent Studio Use, meaning they can work outside of regularly scheduled studio hours, provided there is not a large group activity planned in the studio. The Book Arts Program schedules special sessions (tours, workshops, etc.) throughout the semester. When these occur, studio access is limited. If you arrive and a special session is underway, please ask the monitor on duty what equipment and space is available.